When Saint Paul met Jesus Christ on the road to Damascus he was about thirty years old. Paul was the son, as he testified in his own letters, of a Pharisee, who also was the son of a Pharisee. Circumcised eight days after his birth according to the Law of Moses, Paul came from a family deeply rooted in biblical tradition. As such, he enjoyed an ongoing conversation with the Lord who spoke to Paul through Sacred Scripture and through Mosaic Law. As a boy Paul began studying the Scriptures before he could read. In class he rehearsed the oral traditions by intoning rhythmic passages taken from the law and by reciting from rote the commentaries developed by his mentor the great Rabban Gamaliel. His days at school were long and spiritually and cerebrally exacting — only through the very Word of life that he loved did he feel renewed. To Paul the scrolls containing the Writings and Prophets were equally sublime. Young Saul (his Hebrew name by which he also was known) studied the Mishnah, an ancient resource compiled to help the serious scholar interpret Torah. Paul knew the Bible by heart but did not recognize Jesus as the Word of God even as the Lord lived among Paul and his people the whole time that Paul was engaged in the study of that same Word. The Son of God was speaking with Paul all the time but the future apostle did not recognize his voice. Not yet. When Paul grew up he became a rabbi. In Jerusalem he listened to the stories told to him by his brother Pharisees about how Jesus of Nazareth denounced the Jewish religious leaders and challenged their authority and this filled the young firebrand with a terrible resolve. He prayed to the God of his Fathers to give him the courage and the power that was necessary to quash the heretical movement brought about by the practitioners of the Way. And so Paul — “breathing murderous threats” — and his companions set out in haste and journeyed north toward Damascus, bedecked in Roman battle gear. Paul prayed: Blessed are you, Lord, who has created me a Jew and not a pagan; a free man and not a slave; a man and not a woman. Like a warhorse, Paul prepared himself for battle. But not the type of battle that he had intended to fight. The details of what happened next are oft-told but worth repeating. Lightning struck. A fragile peal of thunder clapped and a voice spoke from beyond the sun. Saul. Saul. … Why? Suddenly Paul the tormentor lay on his back with his arms raised toward the power that put him on the ground, surrounded by darkness and helpless beneath the careful steps of the celebrated horse. What happened? In his mind Paul was thinking, what is the biblical basis for this encounter? Where have I heard this portion of the story before? Whose voice am I hearing? Abraham! Abraham! Moses! Moses! Yes, now I remember. What’s my line? Here I am, Lord, I come to do your will. At last Paul heard the voice of the Lord that he had been listening to from the sacred pages all along. This was the crucial moment in Paul’s story, the instance to which he continually referred as he moved into the future that God had planned. Jesus appeared to Paul precisely at the moment ordained by God, what the Greeks called kairos, or vertical time, as opposed to chronos, the linear sequence of events in the physical universe — one thing happening after another. Kairos is the storyline followed by the authors that contributed to the canon of Scripture, a nonlinear history of God’s dealings with his people. Paul was in the right place at the right time because God wanted him to be there so that he would encounter his Son. The young Pharisee’s lifelong Bible study had prepared him to receive, at last, the Resurrected Body of Christ. At noon on that day outside the city of Paul’s destiny, he made his first holy communion. This revelation delivered unto Paul graces impossible to adequately commit to paper or to express in speech, even through the gifts of literary acumen and glossolalia (speaking in tongues) that he received. Gamaliel had trained Paul well, infusing within his protégé the ethos of charity as exuded by Gamaliel’s grandfather, Hillel. If not now, when? If not me, then who? With great integrity and purpose Paul undertook the vocation to which he was called. Each time he set pen to paper or opened his mouth to preach the gospel he relived a reality too vivid and clear to deny or forget. Paul had seen the face of God and lived. He was writing — and living — the very Scripture that he loved. 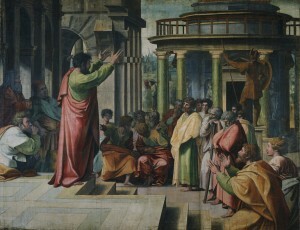 Pharisees were religious leaders who supported themselves by practicing a trade. As a Pharisee, Paul continued to study the Bible because it was his calling but he also worked as an artisan and a craftsman; he was a tentmaker: he made tents, awnings, leather sandals, and belts. A strong man with dexterous hands, like his Master the carpenter from Nazareth, he toiled night and day using a loom, a needle, and a spindle to ply his craft. Every day but the Sabbath he sat in the marketplace plying the spindle and telling other merchants and customers about Jesus to pay reparations for savaging His Church. The more Paul wrote and talked about his Lord the more he affirmed his own commitment to explore the center of his soul where he knew God lived, the depths from which God had spoken to him and continually revealed his will. Cor ad cor loquitor: heart speaks to heart. He grew up in Tarsus, a Roman free-city founded at the base of the Tarsinian Mountains, with gorges so jagged and deep that advancing marauders turned back rather than traverse the perilous peaks. In the Bible the mountain is the setting for humanity’s encounter with the divine, the setting for the stories of Moses and Elijah that Paul loved and knew so well. He appreciated nature — the world was filled with the wonder of God’s creation, a mystery that Paul contemplated, his intellect nourished by a steady intake of the Wisdom literature, Isaiah the prophet, the hegemon Job. Paul placed himself within the context of the vertical history authored by the Creator; never could he exhaust the source. Who has known the mind of the Lord? Who has been his counselor? He breaks into rapturous praise, speaking directly from his Jewish upbringing and Hillelite rabbinical training. O, Lord, my Lord, who can understand your judgment? Or who can explore the depth of your way? Or who can discern the majesty of your purpose? Who of those born has ever discovered the beginning and end of your wisdom? (2 Apocalypse of Baruch 14:8-9). For years Paul wrote letters in which he analyzed and explained the mystery of redemption (his own) and salvation (that of his people, Gentiles and Jews), summing up his thoughts and his wonder as doxology to express the awe he felt in the presence of God. “O, the depth and riches and the wisdom and knowledge of God! How inscrutable his judgments! How unsearchable his ways!” (11:33-34) Years later he could not fully understand nor did he want to; he never stopped listening for the voice of the Lord. This is the grace-filled acclamation of a healthy heart reveling in the majesty of God, whom he believed exercised control over humanity. The Lord alone knew of its designs, its purposes, and its fulfillment. The universe was not arbitrary, not rushing aimlessly to an unforeseeable destination only to come to a halt when time ran out. God indeed was the creator, sustainer, the alpha and the omega, drawing all things to himself. I really enjoy Fr Cordani’s articles, but there are a few things I am unclear about. I read here “Young Saul (his Hebrew name by which he also was known) studied the Mishnah”. But I also read “All ancient sources are in agreement that the Mishnah was compiled by Rabbi Judah the “Prince,” before his death around 217 C.E.” (http://people.ucalgary.ca/~elsegal/TalmudMap/Mishnah.html#Comp). This article also says Paul was “bedecked in Roman battle gear.” Where is the reference for this? Fr Cordani also wrote “Paul prayed: Blessed are you, Lord, who has created me a Jew and not a pagan; a free man and not a slave; a man and not a woman”. Again what is the reference? Is there any reliable reference for “the careful steps of the celebrated horse”. Finally I see in this article “Each time he set pen to paper”. Did Paul write using pen and paper? Hi there. I enjoy your comments. Let me answer them point by point. 2. Bedecked in Roman gear. Scripture does not say he was wearing Roman battle gear. Scripture doesn’t say that he wasn’t either. 3. Prayer: Same as No. 1. 4. Horse: See No. 2. 5. Ate/drank: Paul received the body of the Lord when he realized that the Body and the Word were one. Spiritually speaking. 6. Pen and paper: N/A. I am a literary writer and this is written as a genre that’s called Creative Nonfiction. That doesn’t mean to make things up and call them true (that’s what fiction does). My purpose is to provide a portrayal of Paul, not write facts per se, since we get so much of the standard “chapter and verse” material. This is simply a story about Paul of Tarsus written based on my prayerful study of his writing, the Bible, and some discernment and thoughts of the heart. This is reading and rereading between the lines and interweaving facts and imagination with prayer and discernment. Thank you so much for your clear, immediate and courteous reply to my queries. I really do appreciate your clarifications and I sincerely hope that my queries were constructive. I really enjoy your posts, as they build me up in the fatih and encourage me.